I had a great stay at Claire and Duncan’s lodge. The two of them are super nice and the whole atmosphere is amazing. It feels a lot more like a home than any hostel or lodge I’ve ever been to. On top of that the daily surf is great and you get to know everyone very easily. Would definitively come back! Really nice hostel! I can recomend it totally, especially if u are into surfing; doesnt matter if u just try it the first time or u are a long time pro. Feels like a family... One of the best stays ive ever had in my life. If you want to learn how to surf go there!! Duncan is an amazing teacher. So good! Thank you again Guys! I will come back. I stayed for 2 weeks at the lodge and had a great time. Claire and Duncan are awesome hosts, super friendly and helpful. The house is very clean and has a large living room and kitchen. Perfect place if you want to surf and meet nice, chilled people. Duncan drives you to the beach every day, where you can surf on your own or take lessons with Duncan and his son Dane. 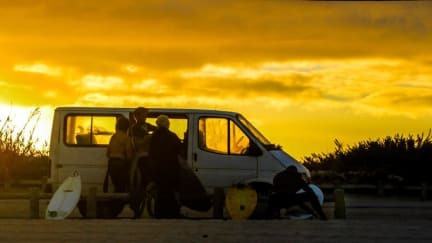 I can highly recommend this place for a surf holiday and definitely will be back. Ich habe mich direkt wohlgefühlt. Claire und Duncan geben sich jede Mühe, dass man sich wohlfühlt. Ich habe jeden Tag genossen! Just like staying at a friends house ! I really enjoyed my time at this cosy place. Thanks to the kind hosts! The best stay I've ever been. A realy nice place to injoy Peniche. Duncan and Clair are really kind and they take care of you very much. I'll definitely come back!